As my regular readers will know I do love entering giveaways - and I like winning even more! Talking Beads was quite a challenge, as I had to name a piece of jewellery and I don't usually go in for "arty" names. The beads were so pretty, such a lovely minty shade mixed with lilacy pink so I had to have a go - and Jean picked "mint julep" as the winning entry! and of course - don't forget to check out her blog in case she does more giveaways! Congrats! 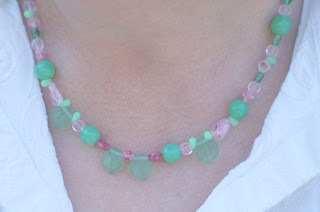 I love the cool spring tones of the necklace! oh that's exciting, I shall come and see. thank you. That is a beautiful necklace and what a lovely name. While you are having some good luck i have a blog comp too. I'll be right over Lucy!